Cyprus Property Blog by Cleo : Chloraka Apartment with Sea Views - NOW SOLD! Fully Furnished Chloraka Cyprus Apartment - NOW SOLD! • 1 bath, 2 bdrm apartment - €69,000 EUR - Title Deeds & Sea Views - NOW SOLD! Chloraka Village, Paphos - This 2 bedroom apartment is located near to the popular village of Chlorakas, within easy walking distance to local shops, restaurants and amenities. Paphos and it’s beautiful beaches are a few minutes away. The property comprises a spacious living/dining room, galley kitchen, two double size bedrooms and a separate family bathroom. Patio doors open from the lounge onto a covered balcony with the most spectacular views of the sea and countryside. The sunsets from here are stunning. 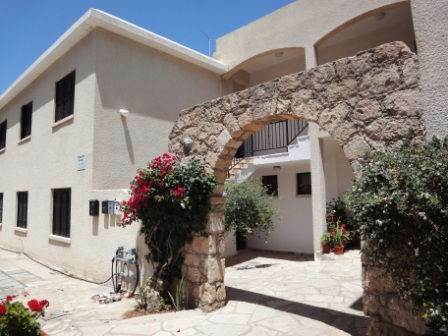 This home is sold but you can browse more Chloraka Cyprus property for sale here!